Coincidentally, 2002 was also the year we last saw a Men in Black film. And yet, those dapper secret agents are now back (yes, in black), and providing a good example for how to relaunch a film franchise. Mike Myers, please pay attention. 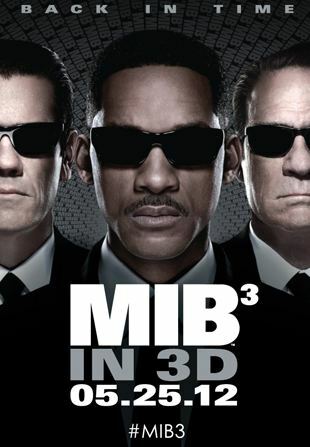 In Men in Black 3, Will Smith’s well dressed Agent J travels back to 1969 to save his partner, Agent K (Tommy Lee Jones), and change the course of history. There, he teams up with K’s 40-years-younger self to catch and kill the extra-terrestrial baddie Boris the Animal — sorry, it’s just Boris — who has been imprisoned on the moon and is hungry for a little revenge against the man who put him there. Yes, the trip-back-in-time plot device is nothing new. Indeed, it’s a twist used often in the third parts of movie series (Austin Powers in Goldmember used it, as did Back to the Future 3 and countless other movies). And sure, things in 1969 aren’t all that different from how they are in the present. There were some cool gadgets, gizmos, and vehicles in the ’60s, the main characters dressed the same, alien creatures were just as weird looking, and the whole thing’s just as slick as it is in 2012. As a movie viewer, you may even forget the film is set more than 40 years in the past. But here’s what 1969 has that 2012 doesn’t: Josh Brolin. The film’s cool, but Brolin’s the real highlight. Men in Black 3 makes good use of two important highlights from 1969 — the New York Mets’ World Series victory and the Apollo XI moon mission — but thankfully, it doesn’t belabor the point that we’re in the ’60s, or make too many jokes about it that pander to the audience. The closest the film gets to this is in a great sequence where J and K visit Andy Warhol’s Factory, and discover Warhol — well, I won’t ruin the joke for you. Suffice it to say, aliens have been a problem for a long time, and the agency has been on the case whether you’ve realized it or not. At a brisk 106-minute running time, this third film accomplishes its mission: It’s entertaining, fun, action-packed, and it doesn’t wear out its welcome. I enjoyed much more about it than I thought I would, given conventional wisdom and my not overwhelming love for this series. So kudos to director Barry Sonnenfeld and his team for winning me over. Kudos as well to Jemaine Clement, of Flight of the Conchords, who makes a great Boris, and A Serious Man’s Michael Stuhlbarg, who plays an amusing alien sidekick who can quickly size up a situation and know how things will end. 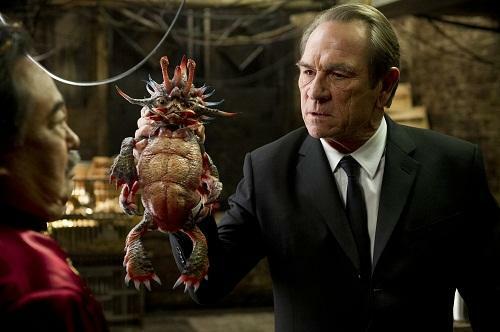 Men in Black 3 is exactly what you hope for in this kind of situation: A pleasant surprise. I’ll reiterate that I hope Mike Myers learns something from it, and doesn’t make an obvious cash grab with no substance in his next Austin Powers film. I’m giving Men in Black 3 a B+.